Adding dark beer to a classic beef chili recipe is a simple way to elevate this comforting favourite. 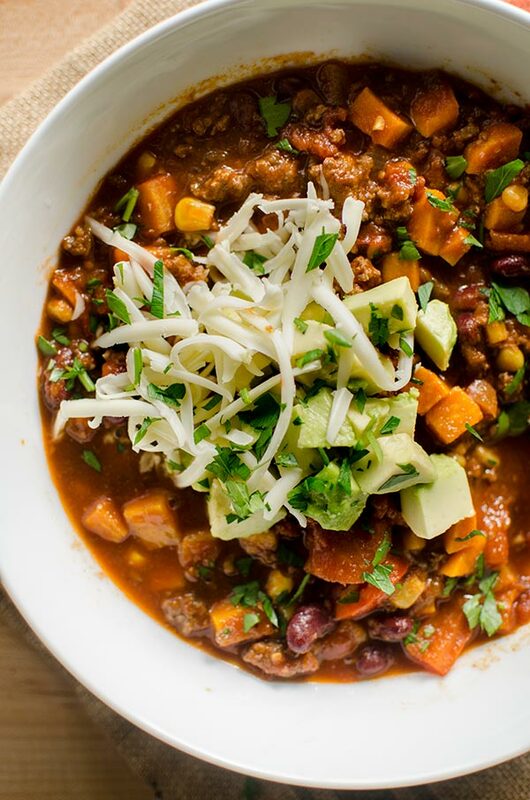 This beef and beer chili has sweet potatoes, corn, kidney beans and tomatoes for the ultimate delicious stew. I was going to write about how February is a bit of a doozy this year, but I think it’s going to get better now that we’re almost halfway through the month. And I feel like I’ve already written about this a million times, and I feel like I can finally see a bit of a light at the end of the tunnel. Instead there are things like cozy chilis and soups and stews that make this time of year a little bit easier. I also find that this is the time of year when I know I have to make more of an effort to be out and about doing things. I find something that has worked well for me in the past couple of years is making an effort in February to reach out to old friends who maybe I haven’t seen in a while. It’s the perfect time to catch up because let’s be real, most people don’t have overflowing social calendars in the middle of February. I’ve posted quite a few chili recipes on Living Lou over the years (this turkey and white bean chili is a personal favourite), because it’s probably one of my favourite comfort foods. I never get sick of chilis and I love that it can be frozen and reheated (this chili freezes beautifully even with the beans and sweet potatoes). This chili recipe is made with beef–I typically go for ground chicken or turkey when I’m cooking, but for this recipe I was inspired by the chili that a friend of mine makes and added a dark, stout beer which I knew would work best with beef. I also love that this recipe has tons of vegetables in it, sweet potatoes, tomatoes, bell peppers and corn. 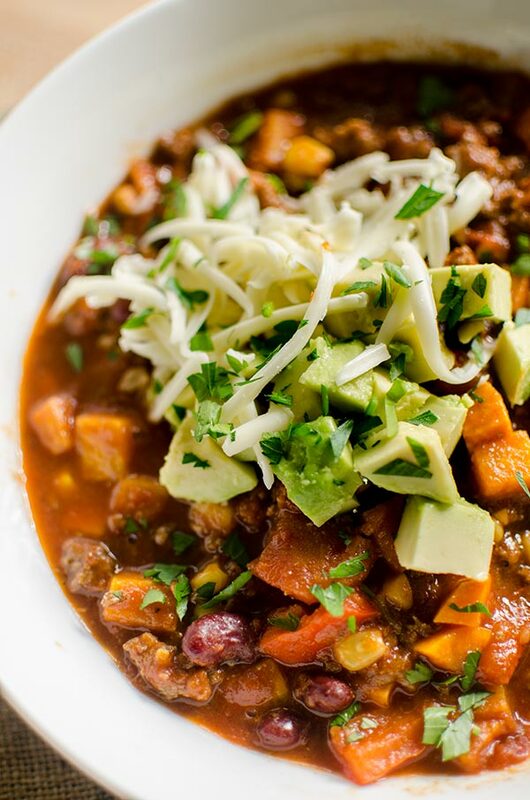 It adds flavour to the chili and also makes it packed with nutrients. Be sure not to skip out on the toppings, cheese is key and I also love to stir in sour cream. So decadent! It’s a match made in heaven. In a large pot, heat olive oil over medium heat. Add onions and cook for 2-3 minutes or until slightly translucent. Add ground beef, cook and crumble until almost fully cooked, about 5 minutes. Add garlic, jalapeño, chili powder, cumin, steak spice, coriander and salt. Cook until fragrant, about 1-2 minutes. Add crushed tomatoes, diced tomatoes and beer. Bring to a simmer, add bell pepper and sweet potatoes. Cook, covered for 15 minutes. Add beans and corn, cover and simmer for another 5 minutes. Let me know if you give this beef and beer chili a try in the comments below.